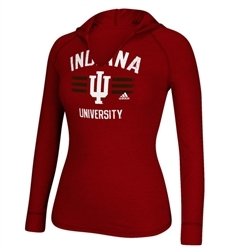 Here's a nice looking Women's ADIDAS Heather Crimson Longsleeve hooded T-Shirt. INDIANA UNIVERSITY IU logo is distressed screen printed on the full front of the shirt. Made of 50% Cotton/50% Polyester and has a very soft hand. Made in ladies 'semi-fitted' sizes only.